Family Owned & Operated for Over 20 Years! Our service manager, Mike Cooper, has recently completed 40 plus hours of training and is now a TIPP Certified Child Car Seat installation inspector. We offer this inspection free of charge to any of our friends and neighbors in the Yardley/Morrisville area. Below is some information regarding child car seat requirements as your child grows. For the best possible protection keep your infant in the back seat, in a rear-facing child car seat, until 2 years of age or up to the maximum height or weight limit of their child car seat. Children in the second year of life (12-24 months) are over 5 times less likely to be seriously injured or die in a crash if they are secured rear-facing. When your child reaches the maximum height or weight limit of the rear-facing child car seat you’ll need a forward-facing child car seat. Preferred location is still in the rear seat of your vehicle. A booster seat will be necessary as you child reaches the maximum height or weight limit of the forward-facing child car seat. Again, the preferred location is the rear seat of your vehicle, with the lap belt across the upper thighs, and the shoulder belt across the chest. 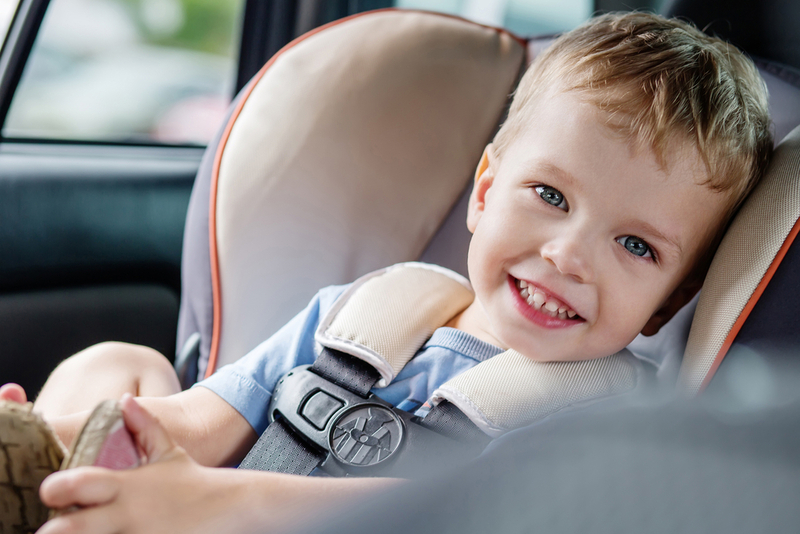 Your child has outgrown the need for the booster seat when the vehicle lap belt fits properly across the upper thighs, and shoulder belt fits across the chest. If your child can put his feet flat on the floor, with his back on the seat, without slouching, and seat belts fit properly, it may be time to graduate from the booster seat. Until the age of 13, it’s still a good idea for your child to ride in the rear seat of your vehicle. Below are some of the details of a TIPP certified car seat installation inspection. It takes about 30 minutes, and of course we’ll need the child car seat, your vehicle, and most importantly, you! Determine appropriate car seat type using your child’s age, weight, height, and developmental level. Check car seat manufacturer website for recalls and safety bulletins. Assist you in registering your car seat with manufacturer. This registration ensures that you’ll receive timely recall notifications. Discuss and determine the best location for your child car seat based on vehicle air bag configuration, child car seat installation method, and other factors. Instruct you on the best method to install your child car seat. Methods include vehicle L.A.T.C.H system or vehicle seat belt. Some of the variables include seat inclination angles, harness positioning and tightness, availability and use of vehicle accessories, and child car seat options. Discuss the proper child car seat configuration necessary as your child grows, and how to know when to change from rear-facing to forward-facing to booster seat and finally to seat belt. Document your inspection with TIPP. This documentation provides installation data that hopefully will help make child car seats safer. Schedule your child car seat installation inspection today by calling us or requesting an appointment online. While you’re here we’d be happy to take care of your PA auto inspection, Mileage based maintenance, or any other auto repair needs you may have. For more child passenger safety information check out www.PAKidstravelsafe.org or call 1-800-CAR-SEAT. "You are always willing to take a look at my car last minute and promptly get back to me." "Everyone was extremely helpful and informative and overall the service was outstanding!" "Using your service has been a positive experience. We have come to trust your fairness in billing and inspections. We have had problems elsewhere." "Great service from knowledgeable technicians." "The staff was extremely polite, friendly and very helpful. Everyone was very honest." "Never adding unnecessary costs! You never suggest work that is not needed."